A research group led by Prof. LIU Shengzhong from the Dalian Institute of Chemical Physics (DICP) of the Chinese Academy of Sciences, in collaboration with YANG Dong from Shaanxi Normal University, reported high efficiency flexible perovskite solar cells using additive assistant strategy. Their findings were published in Advanced Materials. Flexible solar cells are lightweight, more portable, rollable, easier to package, store, transport and install. The low temperature interface layer and high quality of perovskite absorber layer play key roles in flexible perovskite solar cells. The researchers used a new additive dimethyl sulfide to improve the quality of perovskite absorber. The research reveals that dimethyl sulfide could effectively enhance the perovskite grain size, improve crystalline, and reduce the trap density of perovskite film. As a result, the efficiency of flexible perovskite solar cells was improved to 18.40% for small area cells (0.052cm2), and 13.35% for large area (1.2cm2) ones, both were the record-efficiencies for the flexible perovskite solar cells for their respective categories. 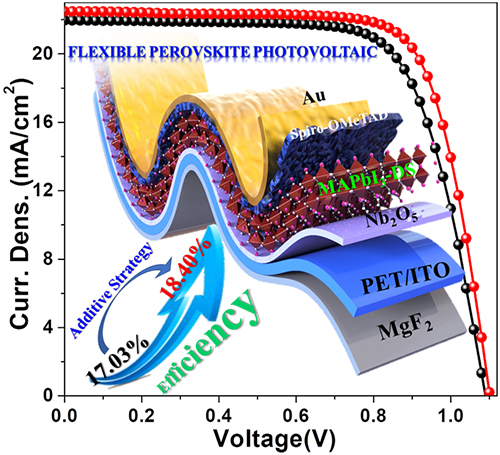 Meanwhile, the stability of flexible perovskite solar cells was also improved when using the dimethyl sulfide additive. The efficiency of the flexible device with the additive maintains 86% of its initial efficiency when stored in ambient at about 35% humidity after 60 days, while the flexible cells without additive degraded by 50% when stored under the same condition. Their findings help guide development of high efficiency flexible perovskite solar cells for practical applications. Previously they developed a low temperature TiO2 using magnetron sputtering to raise the efficiency of the flexible perovskite solar cells to record high 15.07% (Energy & Environmental Science). Subsequently, they exploited ionic-liquid as the electron transport materials to fabricate the flexible perovskite solar cells, and the efficiency was increased to 16.09% (Advanced Materials).